Morokei is one of the eight high-ranking dragon priests of Skyrim. He is located in the antechamber of Labyrinthian, and possesses both the Staff of Magnus and his eponymous mask. As you journey through Labyrinthian, ghostly images from the past reveal that Savos Aren had encountered Morokei prior to you. In an act of desperation, he sacrificed the lives of two College students in order to keep Morokei sealed within Labyrinthian for the good of Skyrim. Throughout Labyrinthian, Morokei taunts you - at first, in the dragon language, then secondly in the Skyrim vernacular - and asks if you are Savos. His disembodied voice, often accompanied by a blue wind capable of sapping magicka, follows you all the way to the end of the dungeon, where he is found incarcerated by two ex-College thralls. Due to the nature of the Staff of Magnus, Morokei elects to use his own spells rather than the staff. 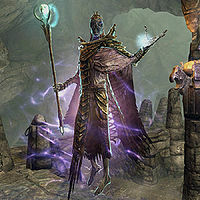 This can make him an exceptionally dangerous foe as he can summon a storm atronach in combat and can turn your own summons against you with the spell Command Daedra. He is particularly dangerous for players using melee weapons against him because of his Lightning Cloak spell. He can also use the following spells: Greater Ward, Chain Lightning, Thunderbolt, and Ebonyflesh. "Wo meyz wah dii vul junaar?" "Junaar" means "Kingdom" in the dragon language. As "brom" is 'north', Bromjunaar translates to 'North Kingdom'. "Nivahriin muz fent siiv nid aaz het." "You do not answer... Must I use this guttural language of yours?" After "Come. Face your end. ", there are a few occurrences of the dragon shout visual effect, and the magicka draining associated with Morokei's voice, but no phrase is heard. Morokei means "glorious" in the dragon language. Morokei can only be encountered after joining the College of Winterhold and starting The Staff of Magnus. Morokei also appears as a Card in the Forgotten Hero Collection card set for Legends. It is possible Morokei will not fight back.